Edgar Rice Burroughs employed and exploited his famous Tarzan character for thirty years from 1911 to 1944 in 24 published novels -- he was still writing about him in 1946 and no doubt would have written many more Tarzan novels had he lived a longer life. It is interesting to speculate on how the mythos of Tarzan developed over the years. His first two Tarzans, Apes and Return make a pair of sorts, some like to include Beasts in the grouping and think of the first three Tarzan novels as a trilogy to balance the great Barsoomian trilogy written in white-hot inspiration during this same period from 1911 through 1914. One might think of the next two Tarzans, Son and Jewels, as faint echoes of his first two mighty novels, but it was with the magnificent short stories called Jungle Tales of Tarzan that he began to reinvent his character by mining the previously undisclosed details of his childhood. This rethinking of Tarzan even led to a planned death of Jane in Untamed. I think he found her difficult to handle in his formula of maidenly princess rescued by a chaste, sexually inexperienced hero. Queen La of Opar reflected the uneasy pivot of a lover’s triangle he did not try to develop in his Mars Series with John Carter and the incomparable Dejah Thoris. One might speculate that the Mars books show his socially expected comfortable marriage relationship with Emma, and the Tarzan Series his growing dissatisfaction with her over the years. I often think of Tarzan the Untamed and Tarzan the Terrible as the most mature Tarzan novels. They demonstrate his writing at his fullest powers and bring to fruition many themes he established around this character over the years. It is especially interesting to hear the echoes of themes from Jungle Tales in Tarzan the Untamed. His short story, "The Little Door" also bears a direct relationship with this novel in his use of the lion as an instrument of revenge. 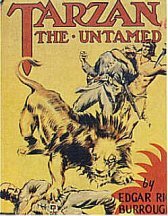 One might think of Untamed as the first book of a new Tarzan trilogy including the subsequent Terrible and Golden Lion since they are thematically related. However, Untamed is mainly a successful cobbling together of short stories, something he had just accomplished in Jungle Tales, while Terrible is a brilliant shining tapestry of a book cut out of whole cloth. Golden Lion concludes threads of his Pal-ul-don theme and even includes Opar in its weaving, which to me earmarks these great novels as material for many articles in years to come. Tarzan of the Apes was a deadly trickster who found imaginative ways to end the dastardly lives of his enemies. It is one of the reasons we love him so much. He was a master of clever, even nightmarish revenge who arranged the gruesome demise of evil men in ways we all secretly wish we might eliminate those who do us harm. And he did it with a smile. Who can forget the trembling last hours of Major Schneider trapped up a tree by a man-eating lion in a narrow gorge? Tarzan set this little scene for us to enjoy in Tarzan the Untamed, placing the wicked Hun there to exact revenge for his "murder" of his beloved Jane. Never mind that he had the wrong Schneider. Never mind that Jane was alive. We can imagine with a Tarzanic, slight smile on our lips the final mad scramble for the cliff, the terrified screams under the rending claws. Ah, sweet revenge! Tarzan was a man with a grim sense of humor. No sadist, he did not hang around to witness the delicious dance of death he had set up. The stunt was similar to the one prepared for the witch-doctor, Bukawai, whom he left bound to a tree in a cave for the hyenas to return in Jungle Tales. He did not stay for the curtain fall that time either, but Burroughs assures us that the hyenas returned. In Tarzan the Untamed, the ape-man loosed the same man-eater who chomped Major Schneider into the German trenches where it wreaked havoc among the native troops. He went to a great deal of trouble setting up the joke: making bags for the head and paws of the lion and prodding it with his spear across a battlefield to reach the site of his deployment. The effort was entirely for his amusement since as he could have moved alone within the trenches killing with impunity. It was a grand performance reminiscent of his "jungle joke" in Jungle Tales when he set a Numa loose in the native village after leading them to believe that he was under the lion skin. The stunts and jokes of Tarzan exhibit well the grim humor of Edgar Rice Burroughs. In his short story, "The Little Door" Jeanne delighted in feeding Germans to her pet lion, and in his early fairy tale, Minidoka ERB thought it amusing to feed animal hunters to Bengal Tigers. In chapter 6 of Tarzan the Invincible, the ape-man pulls off a brilliant escape when finding himself in a room with a lion while being pursued by priests of Opar. He simply opens the door as the lion charges, and it claws its way through the mob. Again, Tarzan does not see the actual carnage behind the door, which he quickly closes again, but he hears the screams, and the familiar "quiet smile" comes to his lips. In chapter 3 of Tarzan and the City of Gold, Tarzan throws a shifta into the face of Numa while executing an escape. It seems it was an effective method of dealing with jungle problems when a lion was around. All in all, Tarzan was not quite so clever with his lion stunts after the great novels of the teens and 1920's. The lion in The Lad and the Lion ate the face off the old man, "leaving only a bloody smear of brains and broken bones to mark where once the features of a human being had been." Not much of a trick, really, but Lad was a novel written in the interesting year (1914) when ERB allowed his beasts to perform in a most grisly manner. Kai Shang of Fachan was eaten by Sheeta, who gorged himself "upon tough and stringy flesh" in The Beasts of Tarzan. And a few lines later in the same novel Tarzan broke the neck of Schneider even as Jane pleaded for his life. "Not again," Tarzan said quietly as he made "a sudden wrench" and heard "a sharp crack." Oh, did I mention? The same Sheeta had already eaten Rokoff in chapter 17 while "a cold smile of satisfaction touched (Tarzan's) lips." "The bridge of the Kincaid was slippery with blood. Beneath the brilliant tropic moon the great beast feasted until, when the sun rose the following morning, there remained of Tarzan's great enemy only gnawed and broken bones." Ah, Burroughs, had he only continued writing this way the entire Tarzan series. Good old Peter Hathaway Capstick in his Maneaters does give OB a run for his money when describing a leopard kill. ". . . the most common death-bite, which should not be confused with the extensive damage so gleefully dished out by a wounded leopard to a following hunter, which would be the anchoring of the teeth in the face, neck or shoulder while the hind legs flash like a pair of supercharged Roto-rooters in overdrive to claw out the stomach and lower intestines, would be that used most commonly on baboons. It's a savage paw-cuff followed by a lightning lunge at the base of the skull which drives in the four canine teeth as neatly as a carpenter would hammer spikes."